Not every site can accommodate equipment of these lengths. Be sure to read the site details when making a reservation on recreation.gov to ensure your equipment will fit into the site you’re reserving. You can also find answers to frequently asked questions about length limits and site types or call the Valley campgrounds office at 209/372-8502. Each campsite contains a fire ring, picnic table, and a food locker and is near a bathroom with drinking water and flushing toilets. In North Pines, food lockers measure 33″(D)x45″(W)x18″(H). In Upper Pines and Lower Pines, food lockers measure 35″(D)x43″(W)x28″(H). Additionally, North Pines sites 101, 103, 105, 107, 109, 111, 113, and 119 have these larger lockers. The following campsites are suitable for wheelchairs and include picnic tables with extended tops. 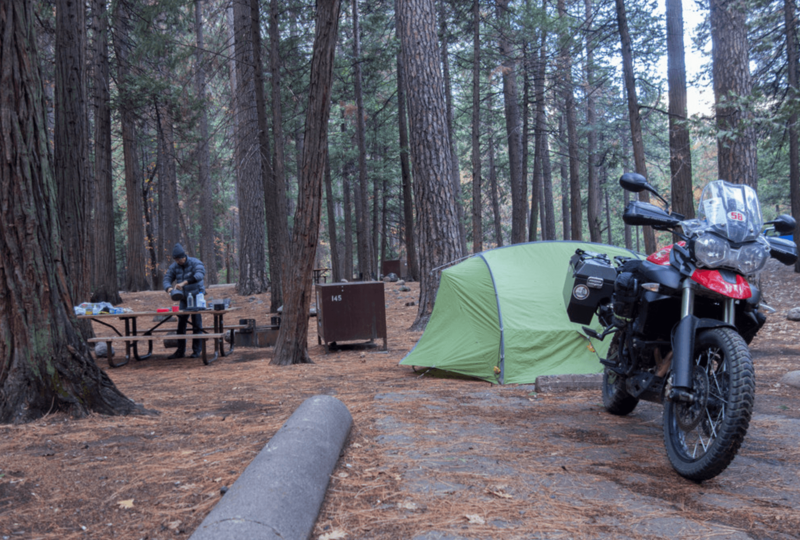 The closest restrooms to these campsites are also wheelchair accessible. These campsites are limited to people with disabilities. Lower Pines Campground has three double campsites (Dbl1, Dbl2, and Dbl 3) that can accommodate seven to 12 people each. The cost for these campsites is $36 (per site). Fires: Wood fires are permitted all year, however, from May through September, campfires in Yosemite Valley are only allowed between 5 pm and 10 pm (campfires are allowed at any time from October through April). Charcoal fires are allowed at any time. People per site: A maximum of six people (including children) are allowed per campsite. There is no limit on the number of tents (as long as they all fit into the campsite). You are required to store food properly in order to protect Yosemite’s bears. Learn more about bears, proper food storage, and food lockers. The following campsites are suitable for wheelchair and include picnic tables with extended tops. The closest restrooms to these campsites are also wheelchair accessible. These campsites are limited to people with disabilities.